Merek thinks two-headed flame-shooting dragons are trouble enough, but will he survive an army of ravenous rats? Sometimes being half boy, half dragon gets really messy. Merek and his family are shape-shifting dragons, living in a human world. It is Merek's heartfelt desire to ... read full description below. 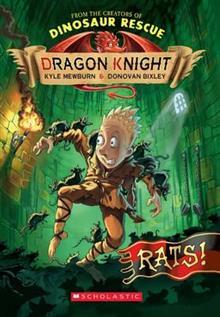 Merek thinks two-headed flame-shooting dragons are trouble enough, but will he survive an army of ravenous rats? Sometimes being half boy, half dragon gets really messy. Merek and his family are shape-shifting dragons, living in a human world. It is Merek's heartfelt desire to become a knight and when he gets chosen for Knight School, he thinks all his dreams have come true. But trying to keep his dragon identity secret - in an occupation that routinely sets out to vanquish dragons - proves a real test for the young trainee knight. 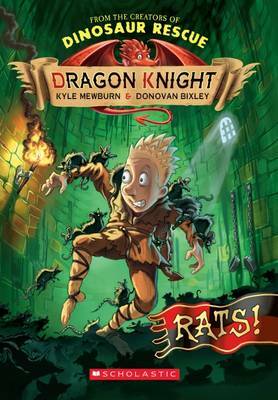 An outrageous and revoltingly funny medieval adventure series for 6+. Kyle Mewburn has had over 40 children's books published in nine countries. His work has won numerous awards, including the NZ Post Children's Book of the Year award for Old Hu-Hu. His other titles include Kiss! Kiss! Yuck! Yuck! (winner of Best Picture Book and Children's Choice at the 2008 NZ Post Book Awards), Melu (Children's Choice winner at the 2013 NZ Post Book Awards), as well as the popular series collaboration with Donovan Bixley, Dinosaur Rescue. Originally from Brisbane, Kyle lives with his wife in Central Otago. Donovan Bixley is a talented artist with a range of styles. His work brings another dimension to Mewburn's text, often adding hilarious bits of his own to enhance the storyline. Donovan has illustrated a number of picture books with Scholastic, including Phoebe and the Night Creatures, Kiwi Corkers Wacko Kakapo and The Tuatara and the Skink, and Monkey Boy, his debut comic book/novel as author and illustrator. Donovan lives with his wife and young family in Taupo.